Published by Joshua Clare-Flagg on 16 Feb, 2015. The two dog brothers in Greek mythology, Orthos and Cerberus, are the focus of the recent releases from Lew & Huey. 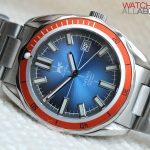 Chris Vail is developing a great following on Watchuseek, and is almost becoming the darling of the Affordables section (although don’t tell him I called him that). His brand displays a lot of influence from our canine friends, especially through Sparky, the dog in the logo. I’m a dog lover, and have a spaniel. He’s pretty cool, although not quite as cool as the pet of a Greek god. Currently the Cerberus costs $525 / £345. So what do you get for your money? Let’s take a closer look. The weight of the Cerberus is 180g. So straight away you get a feeling of quality, thanks to the sheer heft of the thing. It’s also reasonably large for what seems to be a cross over of a dress and divers watch. Measuring in with a 42mm diameter, 50mm lug to lug length, and a height of 12.5mm, it’s not on the slim and slender end of the spectrum. The specs say that it is large, but truthfully, it doesn’t wear as such. 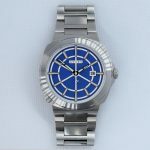 This is probably mainly due to the thin bezel allowing most of the diameter to be the dial, plus the blue rehaut does an impressive job of creating a slight optical illusion. The size may be a turn off for some; but for me, I’m happy with a decent sized case – especially when it manages to appear less than it actually is. 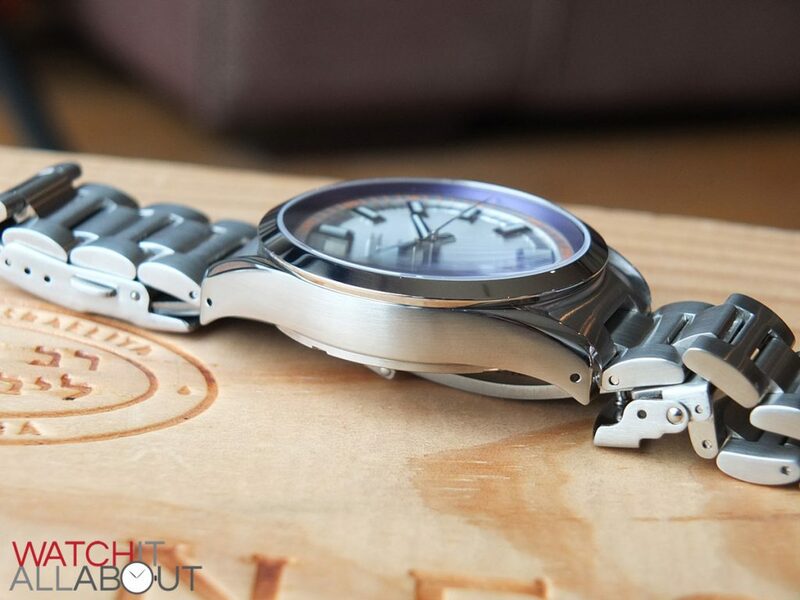 The case is 316L stainless steel, and is finished alternatively in a variety of places. 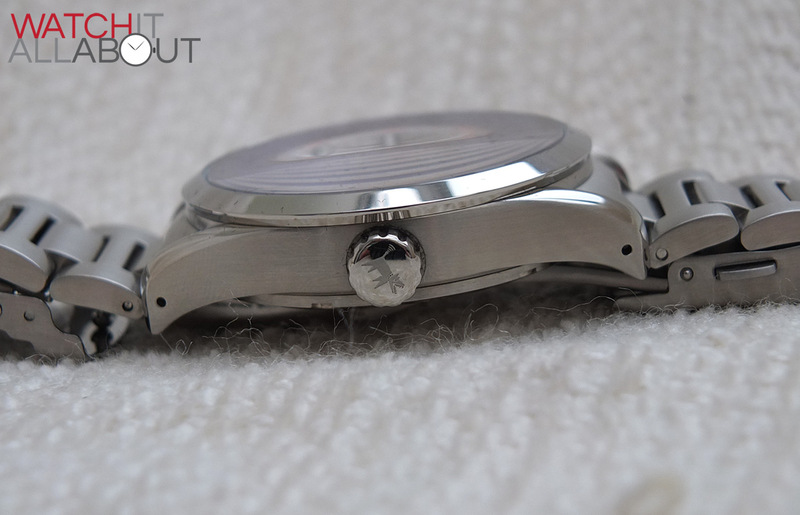 The bezel and top are polished; as is the caseback. The sides and underneath are brushed, as well as a lovely little touch being the inside angle of the lugs (creating a great contrast in finish). Where the opposing finishes meet, the join is clean and accurate. The finishing in general is very good, with no signs of any poor machinery. 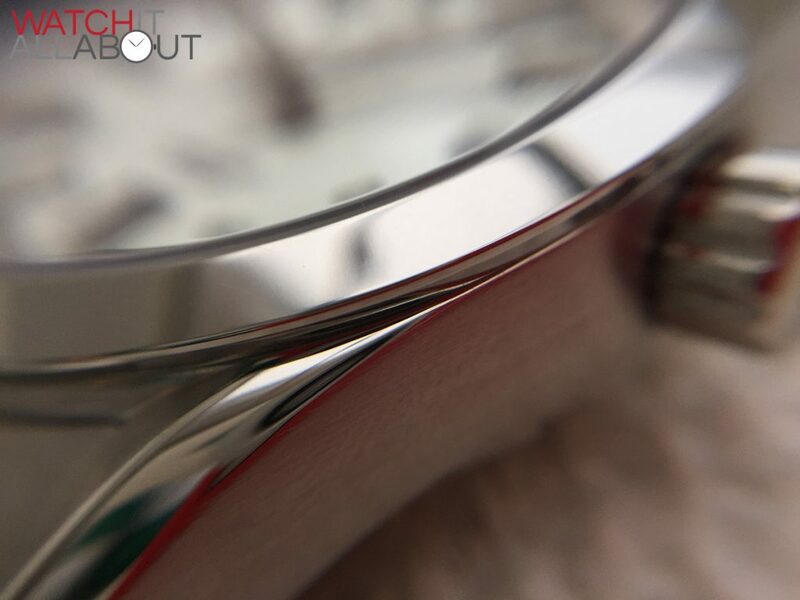 I really like the polished bezel – with its mirror-like finish it really sets the watch off in how it reflects the light. 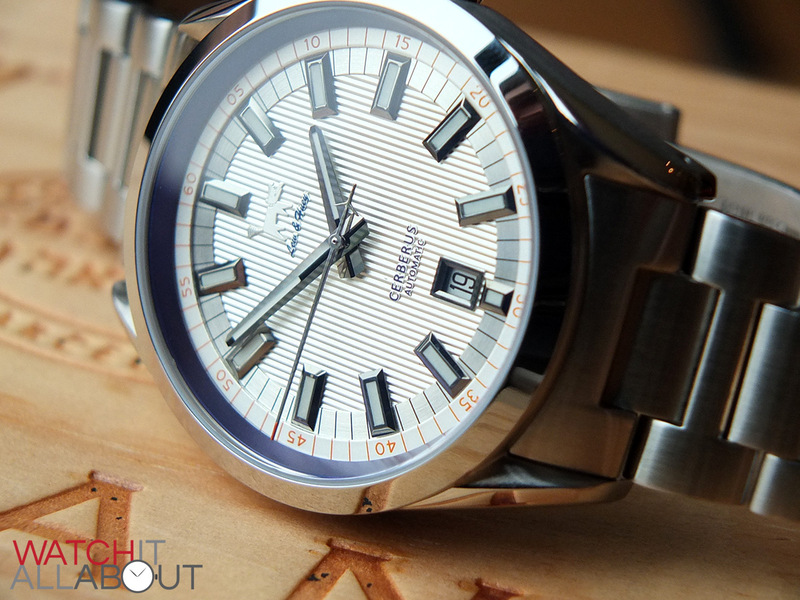 The Cerberus boasts a sapphire crystal with an excellent layer of anti-reflective coating. 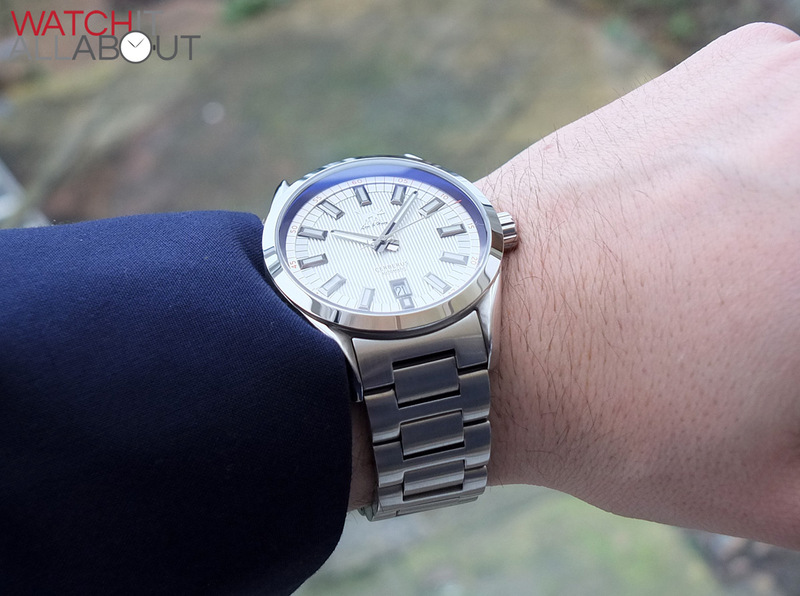 This works splendidly with the light coloured dial, providing brilliant clarity. 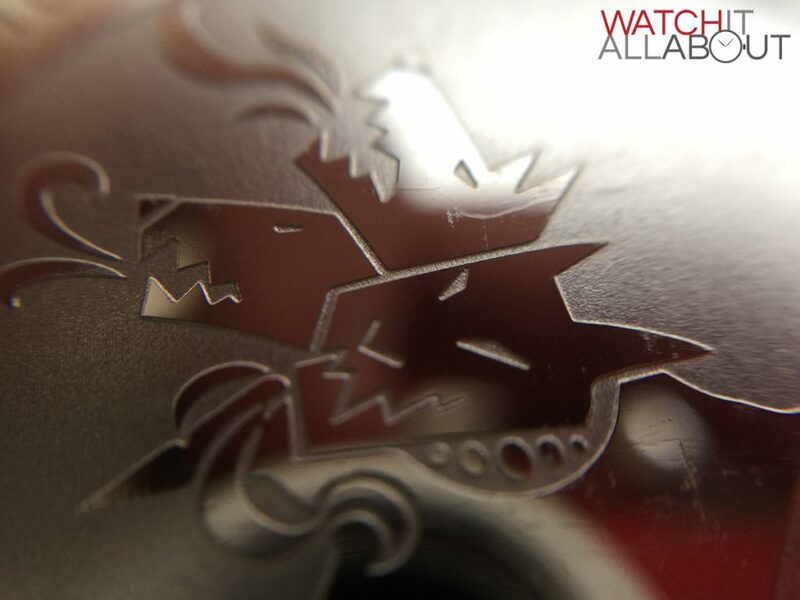 The caseback is screw-in and fully polished, with a motif of Cerberus the three-headed dog. It’s fairly light etching, but enough to get good definition on it. 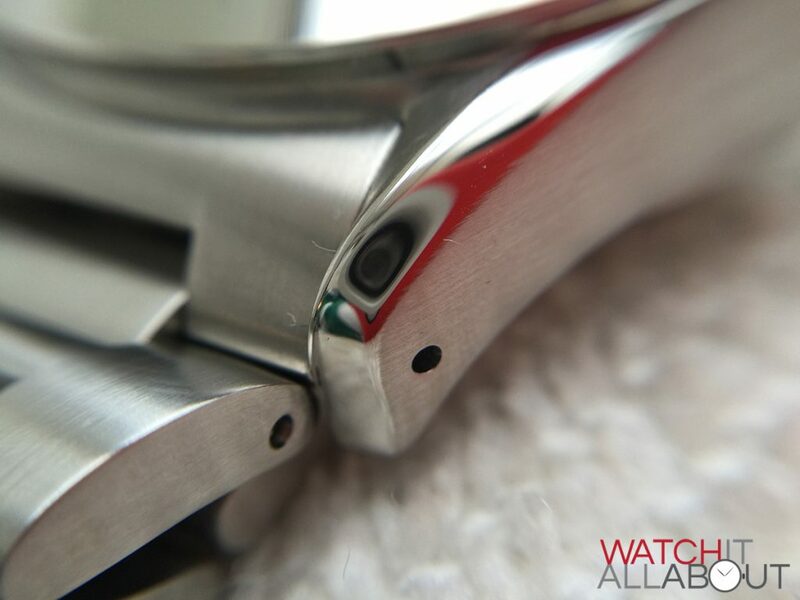 Surrounding this are details of the watch, such as the name, water resistance rating and the date it was built. The crown is push-pull, and features Sparky the dog deeply engraved on the end. I think from a design viewpoint it could have been a little thinner, but this may have resulted in it being hard to use. 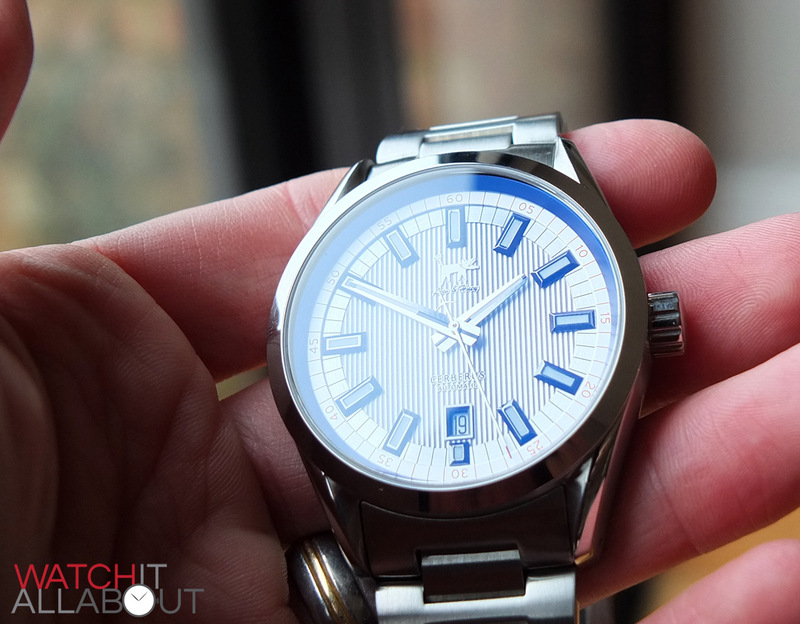 The grip is fairly deep, without being too excessively chunky and aggressive looking, matching the watch well. 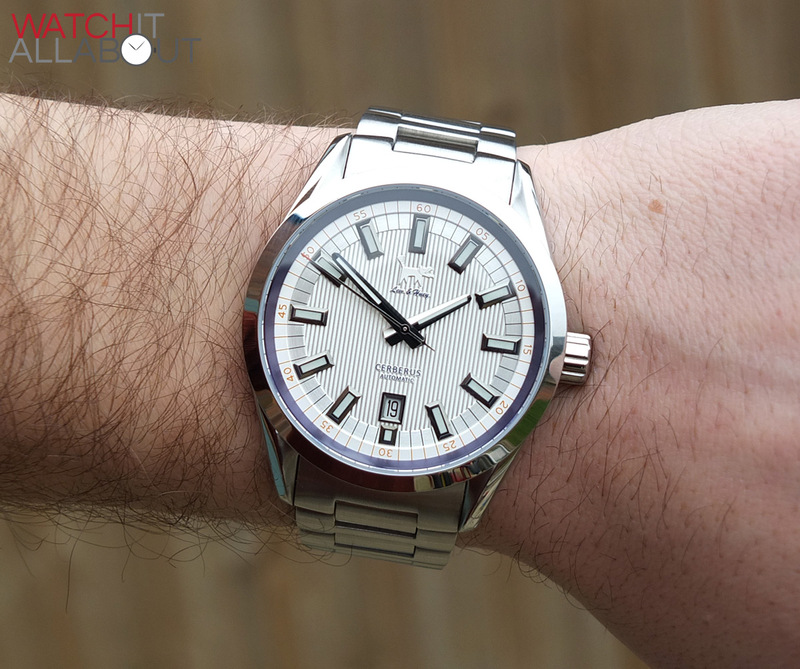 It allows you to set the time and date perfectly well with no issues at all. 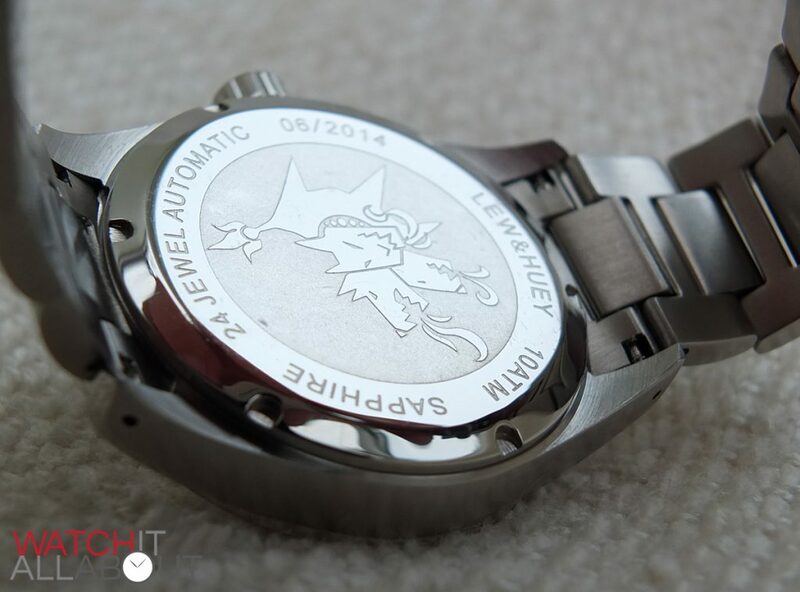 The Cerberus has a 100m rating of water resistance. It possibly could have been higher if it had a screw-in crown, but to be honest it’s not a diver, so this is plenty. It does mean that you can immerse it fully under shallow water, which is perfectly suitable. 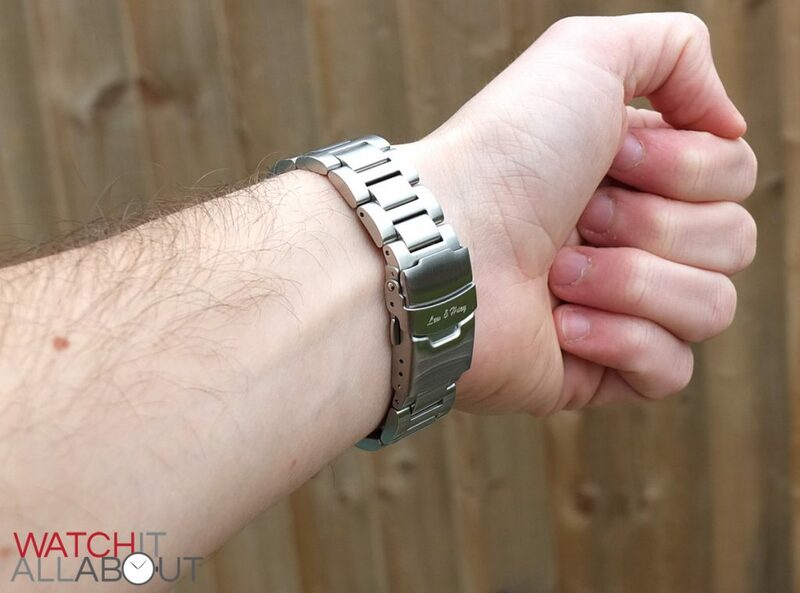 One final thing to note (more on it later) is that the lugs are drilled-through, so you can access the spring bars form the outside, making changing the bracelet easy and reducing any damage that may happen from doing so. The case as a whole is very well made, and has good fit and finish to boot. The lovely linear guilloche pattern within the centre section is the main star of the Cerberus. It’s all constructed with precision, and reflects the light alternatively depending on the angle, which is visually very pleasant. The logo is situated in the top half, and the words Cerberus and automatic are in the bottom half. These are all printed on a slight raised platform which is good to see, and are printed precisely too. As one of the people who aren’t too fussed about the logo, I’m pleased to see it take on a more understated approach, being the same silver colour as the dial itself. The central section is flanked by two chaper rings, both made of stainless steel with a circular brushed finish and at different heights. I think these provide an excellent subtle framing to the centre. Both have the minute track printed on, so they do serve a purpose rather than just being a design feature. I always enjoy applied hour markers, and the Cerberus does not disappoint. I especially like how they’re all sunken into the first chapter ring. A lot of time and effort would have gone into getting this just right, and that is what it certainly is. They are all 3D batons with beveled edges and lumed centres, precisely made and applied. The date window is located at 6, which is good to see rather than the more common position at 3. 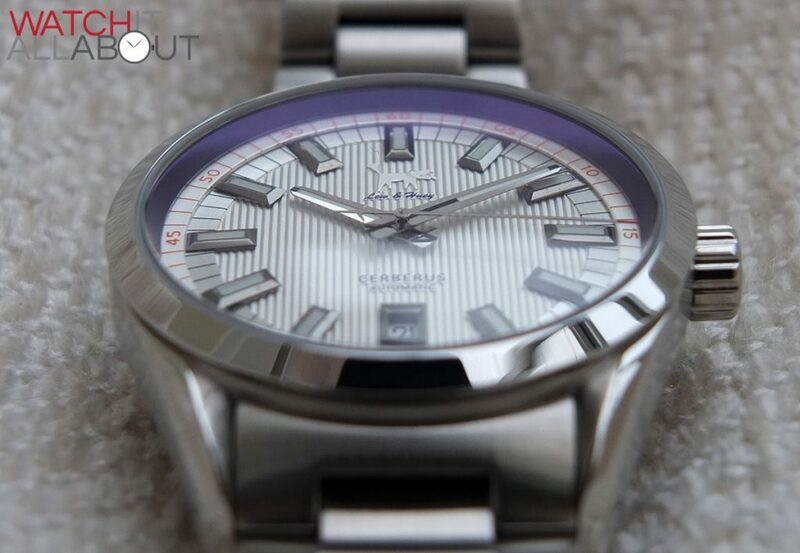 It has an engaging polished steel border around it, contributing to the reflective arrangement of the entire dial. 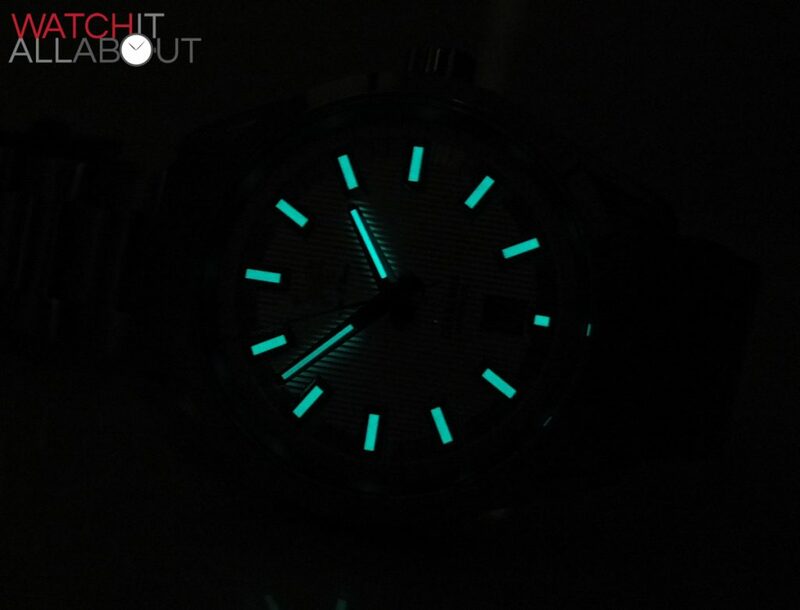 The lume on the Cerberus is very good; above average as tends to be the case for Lew and Huey: the Acciona had outstanding lume. The lume on the Cerberus does indeed perform better than others in this price range. The hour and minute hands are a delicious shape, being a type of dauphine where they have a steady increase of width. They have rounded pointed tips, and a curved bottom, with lumed centres. The seconds hand is thin, sporting a red tip, and a nice little plane as a counter balance. All of the hands are flawlessly made. The rehaut has a gorgeous deep blue colouring to it, so deep it’s almost purple. 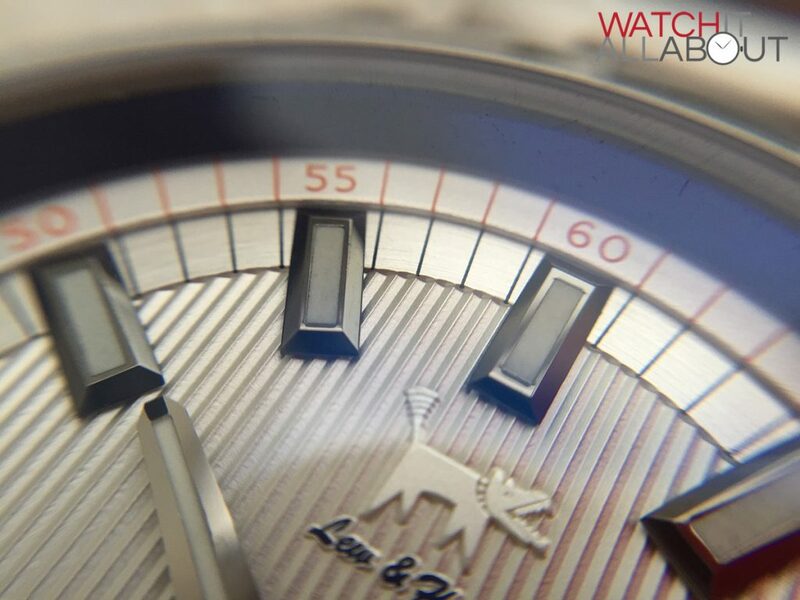 This is an impressive design feature as it doesn’t spill onto the dial at all, but when the light catches it just right, there’s an attractive bluish tinge that flashes across the underneath of the crystal. 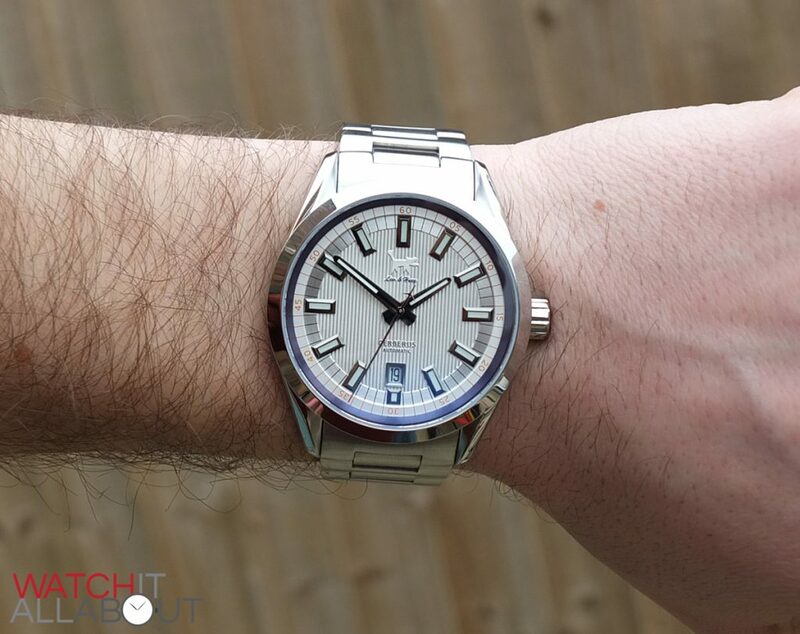 This mimics a much more expensive watch with that lovely top side anti-reflective hue (think Omega Plant Ocean), but without the added cost and the possibility of scratching it. I think this is a great addition and has transformed the watch from a standard watch to a fantastic looking watch in the flesh. The dial on the Cerberus is great. I love the design, and the execution is great to match. 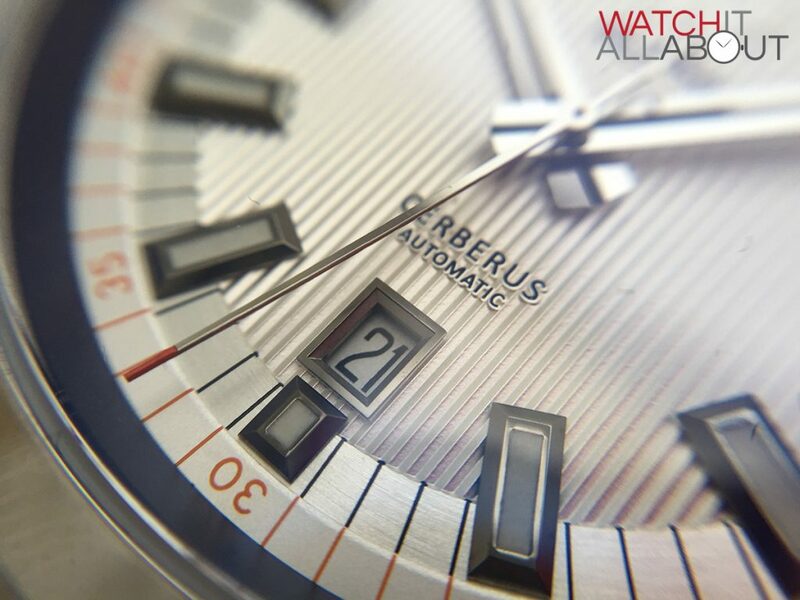 The movement within the Cerberus is the Miyota 9015 – a movement we’re becoming incredibly well acquainted with. 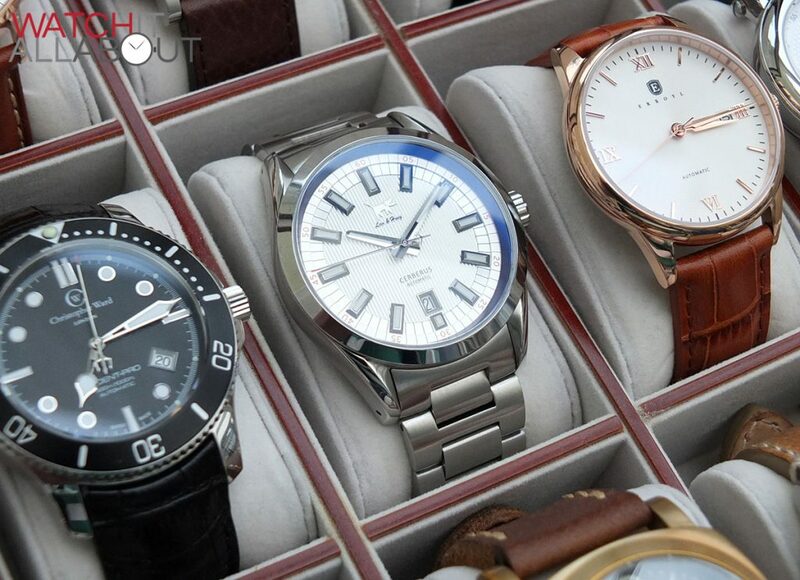 It’s found in a huge amount of high quality affordable watches, due to it being a cheaper equivalent to the popular Swiss autos by ETA and Sellita. 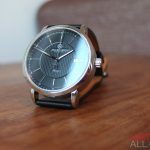 It offers the same specs as they do; namely, a high beat of 28.8k bph (8 ticks a second), over 40 hours power reserve, and hand winding ability and a hacking seconds. It’s fairly accurate straight out the box too, and I’ve jet to hear of one break. They’re rugged (not the best looking mind you), dependable, and will look after you for many years to come. The bracelet, much like the one on the Orthos (it seems to be the same bracelet) is superbly chunky and built to last. It measures 22mm at the lugs, reducing to 20mm within first two links. So it’s certainly thick – and not only in its width. The links are also very hefty and Lew & Huey haven’t skimped on the steel here – there’s a plentiful used in each and every link. I personally love a decent heavy, chunky bracelet, so I’m pretty impressed by it. 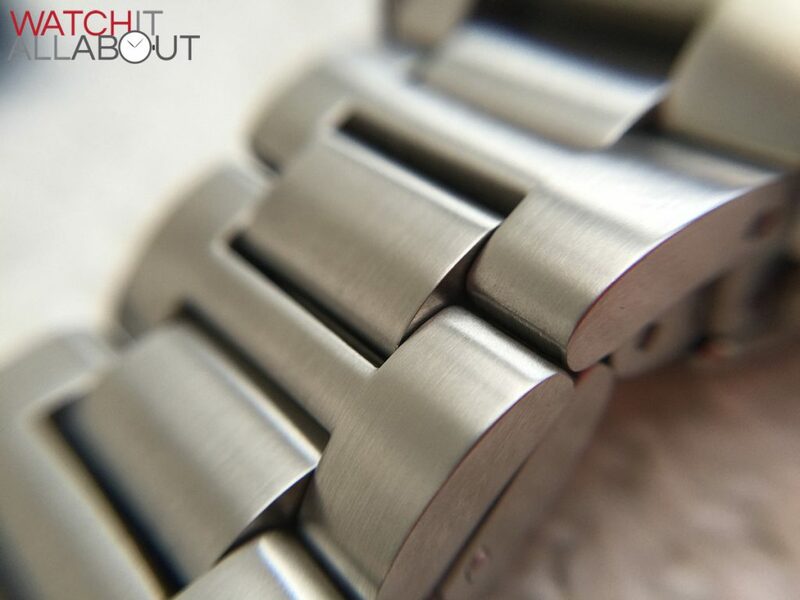 The entire bracelet is fully brushed stainless steel, which not only is suitable from a design perspective but also practical. I always find polished bracelets gather hairline scratches instantaneously without even wearing it. The bracelet also boasts solid end links, which of course is always a good plus, especially when they fit the case well, as is the case with the Cerberus. The links all have standard pins, so you’ll need a pin removal tool to resize the bracelet, but this is simple enough. One positive that I always like to see is drilled-through lugs on the case. This means the lugs have holes drilled through on the sides, so it’s easy to remove the bracelet – you just push a thin tool through which releases the spring pin in the end lugs. 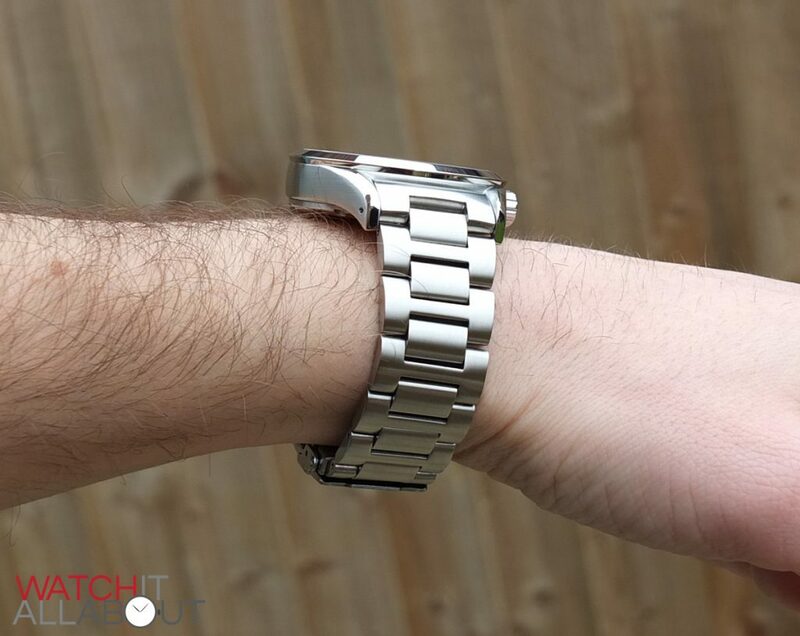 The reason why this is a plus is that you don’t scratch or damage the case in any way when trying to remove the bracelet, which can at times be a real pain. Another design positive that I really like is the “H” links used on the bracelet. It’s a style not used often enough, and it results in a comfortable wear. 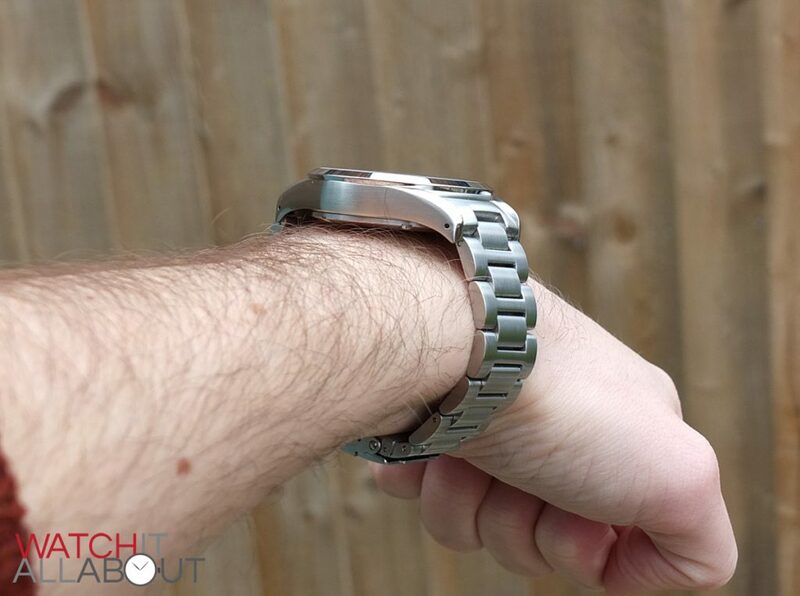 This is because the H links and mid section links work well together to create more angles, and therefore a much smoother underneath for the wrist. The buckle is also fully brushed, and is very secure thanks to the fact that it’s double locking. The two locks are firstly the flap, which has a deep engraving of “Lew & Huey”, followed by the main clasp section which has to be opened up by depressing the pushers on either side. So it’s definitely dependable – there’s very little chance that this will pop open by itself. One final thing to notice regarding the bracelet is how much larger than normal it is. I have a 7.5″ wrist, and to get the bracelet to fit I’ve had to take out all but one link. So I fear that if you have a wrist smaller than 7″ I’m not too sure if it’ll fit you. That one small issue aside, it is a great bracelet, with attractive design and impressive build quality to back it up. 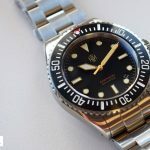 The competition that first came to mind for me is the Steinhart Ocean 1. 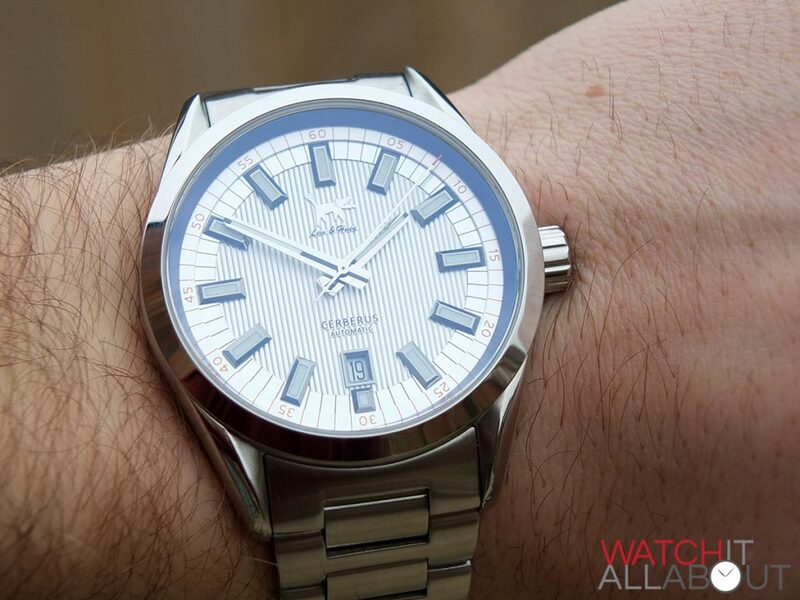 It’s similar in that it can be classed as a bit of a smart / diver crossover watch. 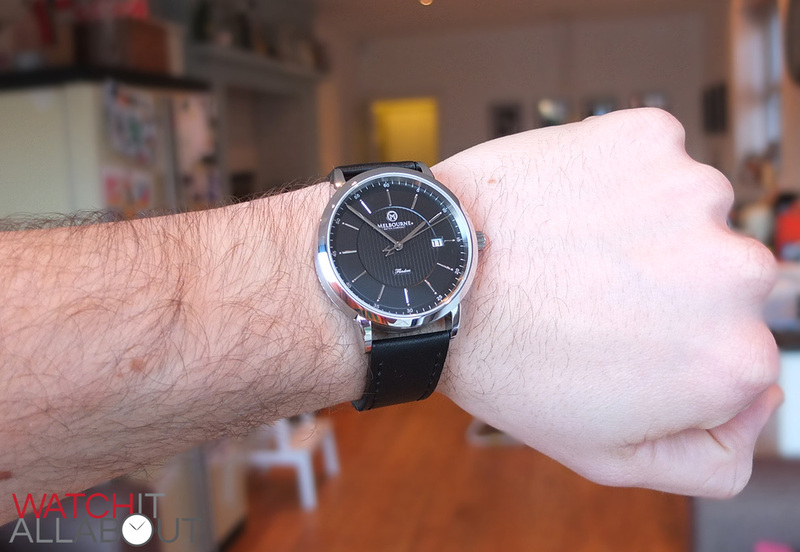 It’ll cost you £300, and is Swiss Made and excellently put together. 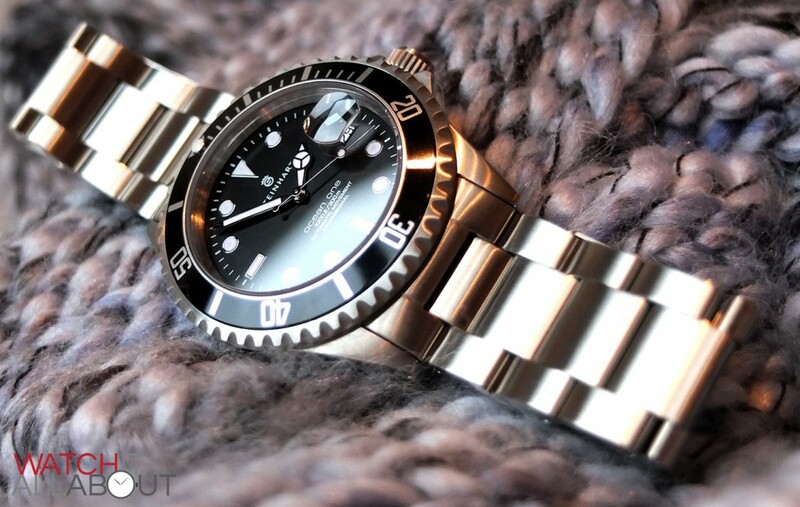 The only problem is getting one (they can be hard to obtain), plus they’re not exactly unique – it’s just like any other Submariner homage currently available. For a slightly smarter watch, but from a company made from the same stock as Lew & Huey, there’s the Melbourne Watch Co Flinders. 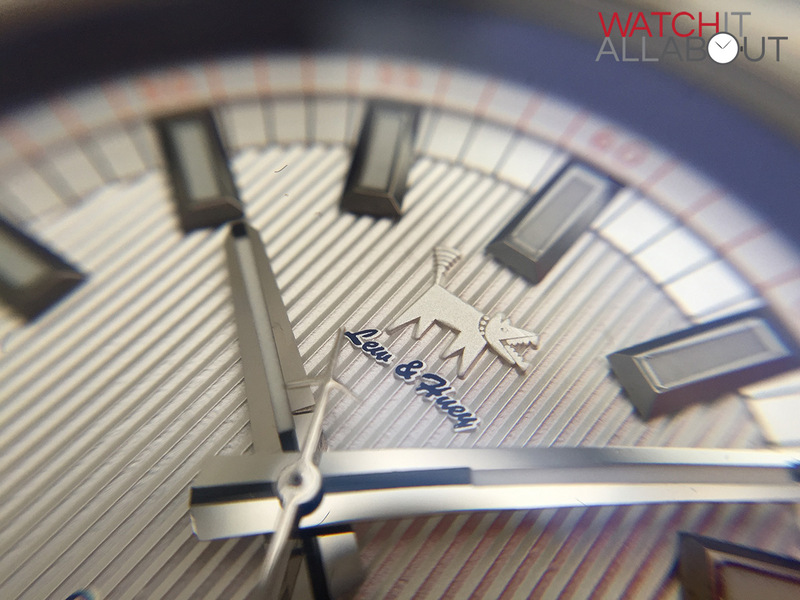 It’s slightly more elegant and smart, and has a similar vertical linear guilloche on the dial. It’ll cost around £280, but isn’t built quite as tank-like as the Cerberus. I think the Cerberus is the best Lew & Huey yet. It combines great build quality with outstanding, classy design. I love the dial, especially the way it plays with the coloured rehaut. 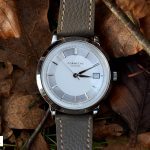 £345 is a pretty standard price for a decent watch by a boutique brand, so you’re definitely getting your money’s worth with the Cerberus. No self respecting man would wear a watch with a childish dog logo. 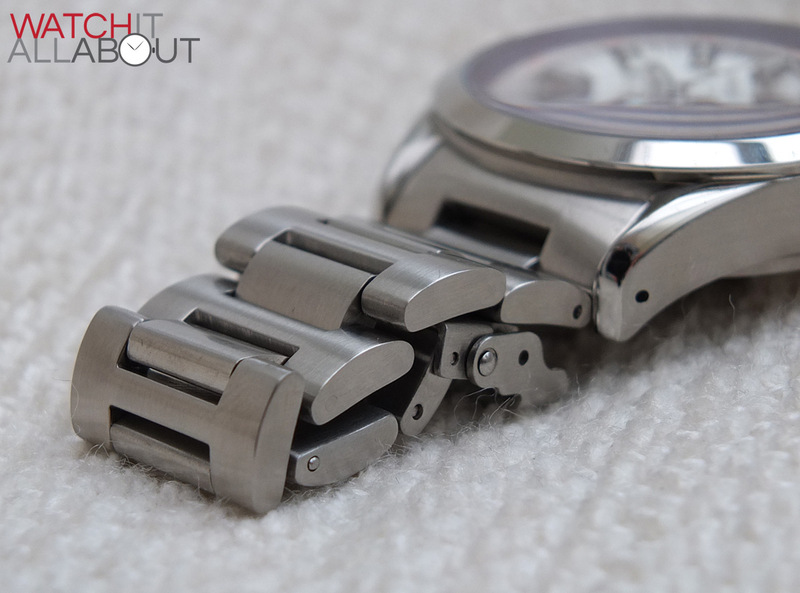 Leave the jokes on the online forum, if you’re going to design a watch be serious. Looks like another Omega stolen design. 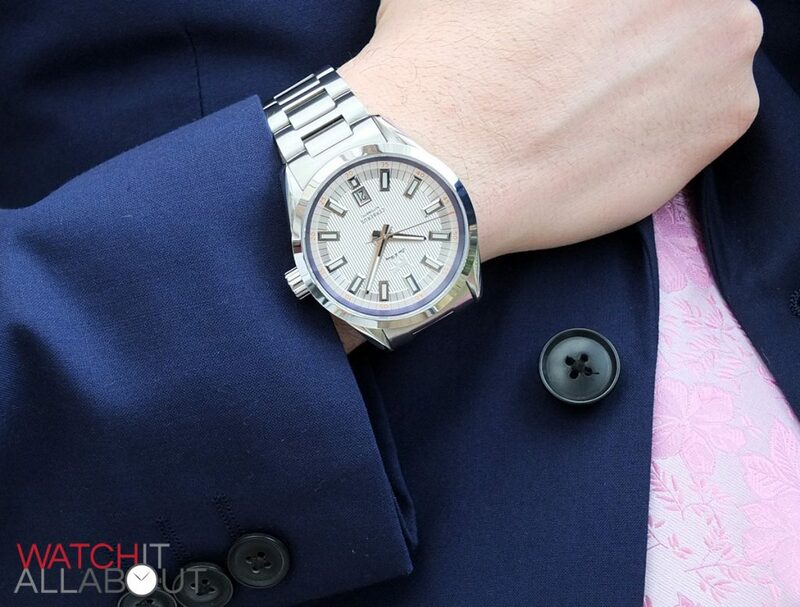 James, life is short……wear a fun watch. If you don’t like this dog, try their spectre. Dog is on the reverse so you should be fine without seeing it. Fortunately , mine is a brilliant Orange. Some men should wear necklace, and your dog a watch like this. No, no… these suckers have no dog! Haha so true Chris does blow up a lot but it’s pretty entertaining watching him justify a watch that is clearly defective. 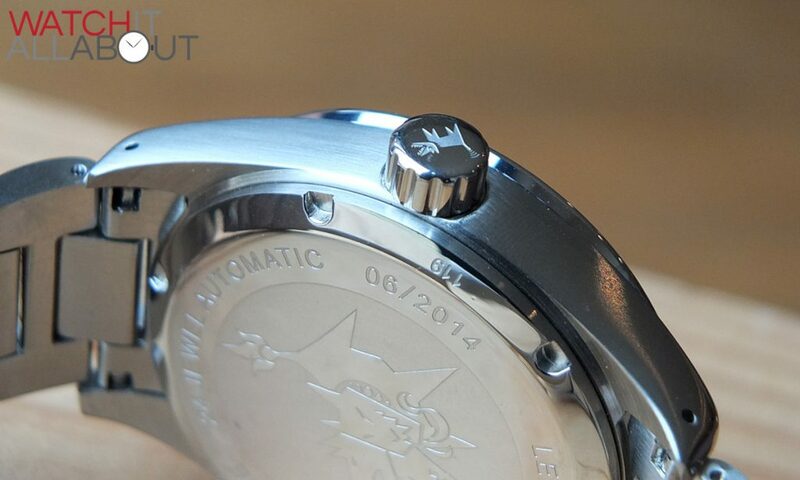 The L&H loyalist will never admit it but I would be pretty ticked if I got a watch with a defective crown. It basically makes the hacking seconds function useless. He still has his small die hard group that would buy anything he designs without question so i wouldn’t say people aren’t going to be buying these watches. Here we go again. As soon as any blogger posts a review of any watch from this brand, the haters come out in force. Can anyone explain why he has such a legion of followers if he’s such a horrible person? It doesn’t seem to make any sense. Does it? 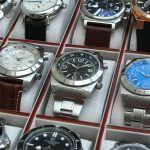 Here’s what I see – he’s been an active participant on a watch forum, where the threads he starts are quite popular, and he’s made many friends. He welcomes new members, takes the time to help people find the watch they’re looking for, put a lot of work in as an unpaid member of their forum project watch, and oh, by the way, sells a quality product at a fair price, and by all accounts from those who’ve actually bought from him he offers outstanding service. He’s got a sharp wit, that’s for sure, and his writing is entertaining as hell. All leading to a handful of people being really jealous, and going out of their way to tear him down, yet he just keeps right on going, only infuriating them further. Actually really digging the look of this watch. I don’t really mind that it’s an Aqua Terra Omega homage I think doc changes enough for this design to be kinda original. I’d probably be all over this thing if there was a chance that I would receive a high level of customer service for the foreseeable future. 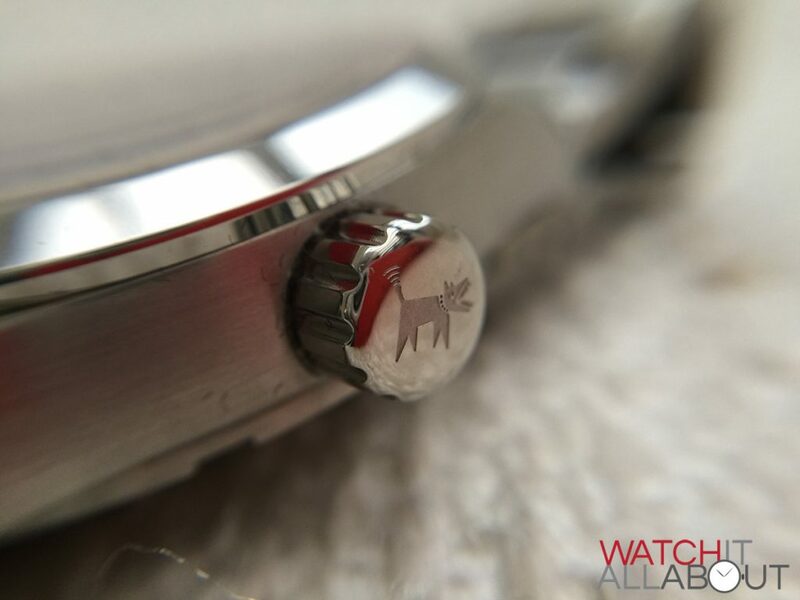 I’ve seen on watchuseek that the Lew Huey brand does not have the best track record when it comes to resolving customer issues with defective watches. 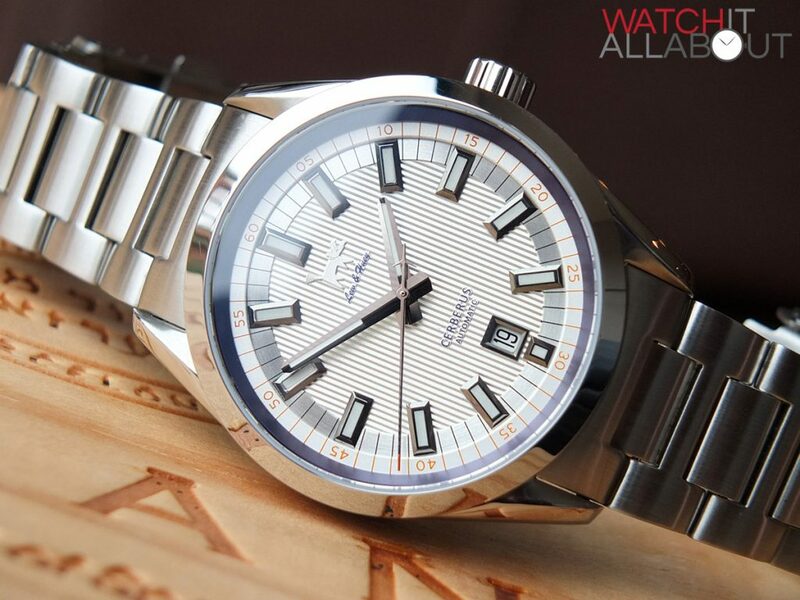 Unfortunately unless that changes I’ll probably hold off on buying this watch. If I’m going to buy a homage watch at this price I’d rather buy a Steinhart at least I’ll be getting a Swiss made watch at a lower price. 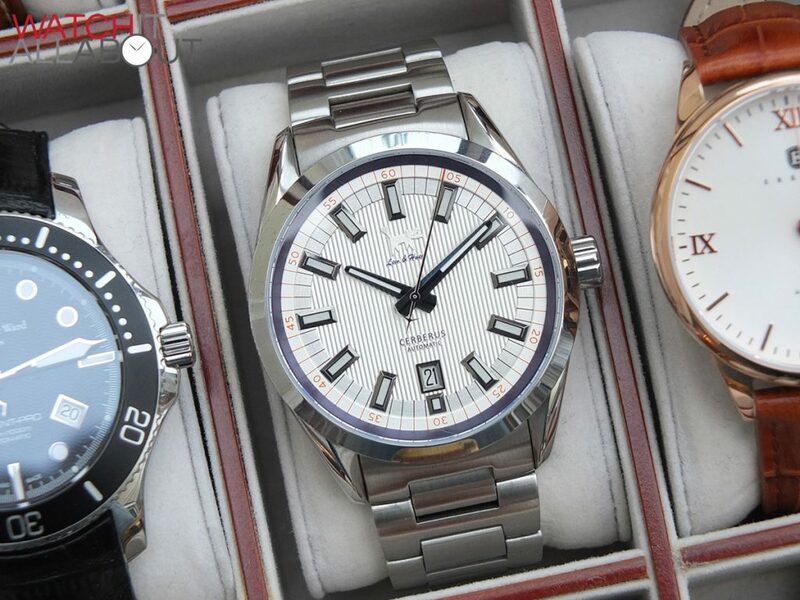 Don’t really get the appeal of these China made micro watches. At least come up with an original design to tempt me. Not taking a chance on micro brands anymore. Mine came with a sticky crown that basically completely ruined the hacking feature. Msged the owner multiple times for warranty work over the past month. Not surprising that there was no response. Steer clear of this brand unless you’re okay with a less than 100% movement. I’m taking mine to my watch guy to get fixed then I’m throwing it on watchrecon to be sold. Waste of money and time.